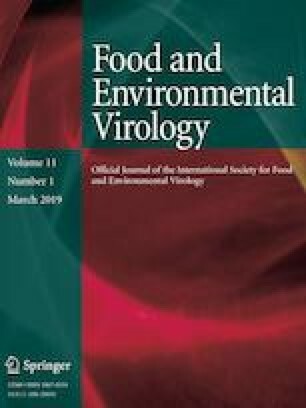 Male-specific coliphages (MSCs) are currently used to assess the virologic quality of shellfish-growing waters and to assess the impact of sewage release or adverse weather events on bivalve shellfish. Since MSC can have either DNA or RNA genomes, and most research has been performed exclusively on RNA MSCs, persistence of M13, a DNA MSC, was evaluated for its persistence as a function of time and temperature within Eastern oysters (Crassostrea virginica). Oysters were individually exposed to seawater containing a total of 1010 to 1012 pfu of M13 for 24 h at 15 °C followed by maintenance in tanks with as many as 21 oysters in continuously UV-sterilized water for up to 6 weeks at either 7, 15, or 22 °C. Two trials for each temperature were performed combining three shucked oysters per time point which were assayed by tenfold serial dilution in triplicate. Initial contamination levels averaged 106.9 and ranged from 106.0 to 107.0 of M13. For oysters held for 3 weeks, log10 reductions were 1.7, 3.8, and 4.2 log10 at 7, 15, and 22 °C, respectively. Oysters held at 7 and 15 °C for 6 weeks showed average reductions of 3.6 and 5.1 log10, respectively, but still retained infectious M13. In total, this work shows that DNA MSC may decline within shellfish in a manner analogous to RNA MSCs. U.S. Department of Agriculture is an equal opportunity provider and employer. Mention of trade names or commercial products is solely for the purpose of providing specific information and does not imply recommendation or endorsement by the U.S. Department of Agriculture. We wish to thank Gary Richards (USDA, Dover, DE) and Brendan Niemira (USDA, Wyndmoor, PA) for critical reading of the manuscript. NSSP Guide for the Control of Molluscan Shellfish: 2017 revision; Retrieved November 1 2018 https://www.fda.gov/food/guidanceregulation/federalstatefoodprograms/ucm2006754.htm.